Gowanda, NY - Harold A. Dash, 63, of Gowanda,NY passed away Thursday, March 14, 2019 at Mercy Hospital. He was born on October 28, 1955 in Gowanda, son of the late Edwin and Pearl (Schmit) Dash. He married the former Rose Braymiller, who survives. Mr. Dash was employed at Setterstix in Cattaraugus as a machinist for many years. He was a member of the Cattaraugus Rod and Gun Club and the NRA. 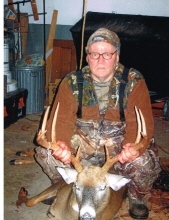 He was an avid hunter and outdoorsman as well as a NASCAR Fan, especially of Tony Stewart. Besides his loving wife of almost 10 years, Harold is survived by two sons; Jason Arthur Dash of Cattaraugus, NY and Jason Michael Dash of Jamestown, NY, as well as two daughters; Jessica Louise (Andrew) Todd of WV and Erin Louise Dash of Cattaraugus, NY. Also surviving are two step-daughters, Joyce Prail of Chaffee, NY and Joann Kleever of Delevan, NY. Mr. Dash is also survived by a brother, Edwin Dash of FL and three sisters; Caroline Renaldo of OH, Jean (Tom) Henderson of Napoli, NY and Linda Korczak of Arcade, NY as well as several grandchildren and several nieces and nephews. Besides his parents, Harold is predeceased by a step-son, James Kleever. Friends may call on Sunday, March 17, 2019 from 2-4 PM at Mentley Funeral Home Inc. 105 East Main St. in Gowanda. Funeral services will immediately follow the hours at 4 PM from the funeral home. Burial will be in Versailles Cemetery. Memorials may be made to the NRA or Mercy Flight. To send flowers or a remembrance gift to the family of Harold A. Dash, please visit our Tribute Store. "Email Address" would like to share the life celebration of Harold A. Dash. Click on the "link" to go to share a favorite memory or leave a condolence message for the family.